Picea sitchensis, the Sitka spruce, is a large, coniferous, evergreen tree growing to almost 100 m (330 ft) tall,  with a trunk diameter at breast height that can exceed 5 m (16 ft). It is by far the largest species of spruce and the fifth-largest conifer in the world (behind giant sequoia, coast redwood, kauri, and western redcedar);  and the third-tallest conifer species (after coast redwood and coast Douglas fir). 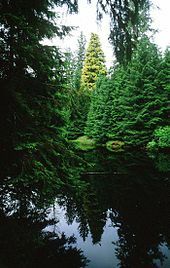 The Sitka spruce is one of the few species documented to reach 91 m (299 ft) in height. Its name is derived from the community of Sitka in southeast Alaska, where it is prevalent. 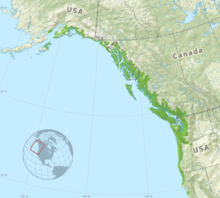 Its range hugs the western coast of Canada and continues into northernmost California. More than a century of logging has left only a remnant of the spruce forest. The largest trees were cut long before careful measurements could be made. Trees over 90 m (300 ft) tall may still be seen in Pacific Rim National Park and Carmanah Walbran Provincial Park on Vancouver Island, British Columbia (the Carmanah Giant, at 96 m (315 ft) tall, is the tallest tree in Canada),[ citation needed] and in Olympic National Park, Washington and Prairie Creek Redwoods State Park, California (United States); two at the last site are just over 96 m tall. The Queets Spruce is the largest in the world with a trunk volume of 337 m3 (11,900 cu ft), a height of 75.6 m (248 ft), and a 4.55 m (14.9 ft) dbh. [ citation needed] It is located near the Queets River in Olympic National Park, about 26 km (16 mi) from the Pacific Ocean. Picea sitchensis has three genomic compartments: a nuclear genome, a mitochondrial genome, and a plastid (chloroplast) genome   . ^ Farjon, A. (2013). "Picea sitchensis". The IUCN Red List of Threatened Species. IUCN. 2013: e.T42337A2973701. doi: 10.2305/IUCN.UK.2013-1.RLTS.T42337A2973701.en. Retrieved 8 November 2017. ^ Masakazu Aritomi; Dervilla M.X. Donnelly (1976). "Stilbene glucosides in the bark of Picea sitchensis". Phytochemistry. 15 (12): 2006–2008. doi: 10.1016/S0031-9422(00)88881-0. ^ Claudia D. Toscano Underwood & Raymond B. Pearce (1991). "Astringin and isorhapontin distribution in Sitka spruce trees". Phytochemistry. 30 (7): 2183–2189. doi: 10.1016/0031-9422(91)83610-W.